Is your dog exhibiting symptoms of destructive behaviour? 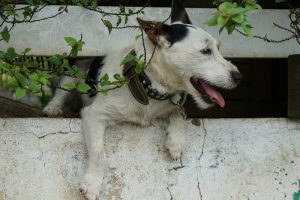 Want some tips on how to resolve these matters in your home and find out the real reasons why dogs become destructive? Nadia Crighton investigates. 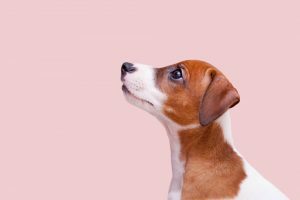 If you are new to the dog-owning game, or you’re an old soul in raising pups, one thing is for sure…at some point we have all had to deal with destructive dog behaviour. Let’s face it, some of us are even guilty of hiding the embarrassing habits of your dog. From eating poop, to consuming lacey underwear, digging a pool or even eating the house! On a personal note I had a beloved Dobermann who would always eat my shoe (yes just one, the left one to be exact) if I were late home from work, even five minutes late! Everyone else in the home could leave their shoes laying around but for some reason if I was running late or not giving her adequate attention she would find my left shoe and go about destroying it. Being left with an impeccable right shoe, I had a ‘shoe graveyard’ of sorts living in my cupboard, as I simply couldn’t justify throwing away a perfectly good Italian leather shoe! With a little patience (and hiding my shoes) this behaviour stopped. She was suffering from separation anxiety and once we tackled the ‘real’ issue the destructive behaviour stopped (and yes…I could leave my shoes around once again without them being destroyed). More information on your dog swallowing foreign objects found here. 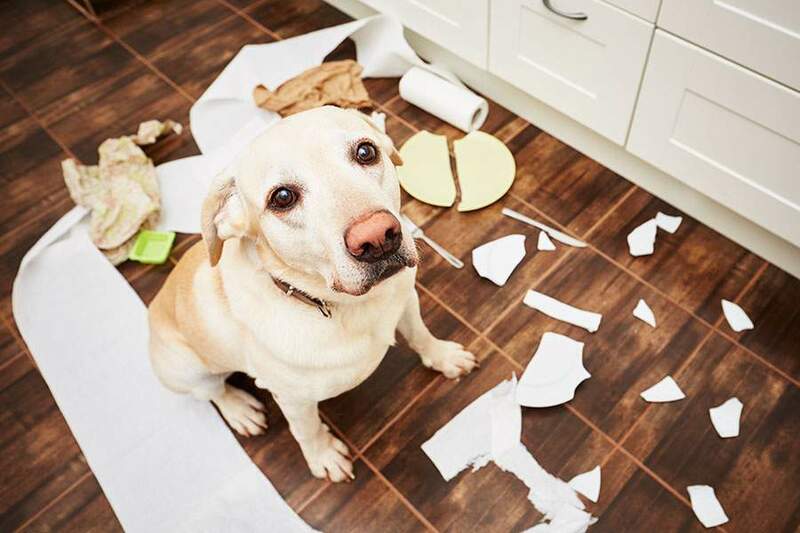 These are the most common forms of destructive behaviour in dogs, when these problems are continuous and normally done when the dog is alone there is a need to seek some help. If these problems are putting a strain on the relationship you share with your dog it is imperative you seek professional advice. All issues can be solved with a little understanding and training. Firstly it’s very important to ask yourself why your dog is behaving in a destructive way. 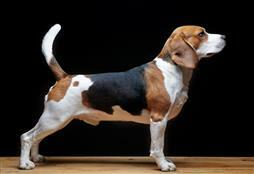 Have a think about when your dog exhibits these patterns? Have they been left alone? Is it on a day when you couldn’t take them for a walk? Is it when you are only out of the home or is it only when another family member is out of the home? Also note (if your dog is chewing clothes or shoes etc) who owns the shoes? Is there a common factor, is it the same persons shoes? Keep a diary for a week and you will start to see common ground when it comes to the destructive behaviour. Is it when you go out for an hour? Or go out for a few hours? • Boredom – it’s important to understand the impact boredom can have on a dog. Imagine being put in front of the same television show every day, watching endless re-runs of the same program day-after-day. This is what your backyard is like for your dog. Stimulating this environment is very important otherwise your dog will find their own entertainment, and chewing, digging and tug-o-war with the clothesline is wonderful entertainment for a dog(read our backyard ideas for some inspiration). Consider having ‘out of house’ toys and pick them up when your return. 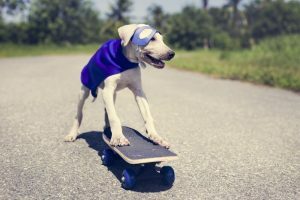 Also look at treat-balls, stuffed Kongs, and other creative ways to stop your dog from being bored. Also remember – out of mind out of sight. Keep your shoes in a shoebox or away from the dog until you have trained this problem away. There are fantastic arrays of ingenious toys that can help beat boredom. The key is to remove the toys once you get home. They are toys or activities to do when you are away. • Separation Anxiety in Dogs – when dogs ‘fret’ they can also become destructive. If your dog is fretting every time you leave the house (or another family member leaves) this could cause them to become destructive. Separation anxiety is triggered when a dog is separated from a certain family member (or even another household pet). Have a look at your dog when you grab your keys or show signs you are leaving the house. Do they exhibit any stressful signs? Are they drooling? Pacing? Whining? Leave the house for a short while and pretend to go out…what can you hear. 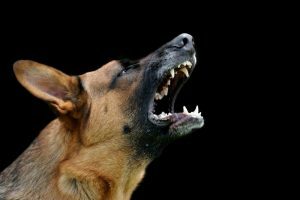 Is your dog howling or barking, do they seem distressed at you being gone? If you suspect your dog is suffering from separation anxiety it’s time to call in the experts and with some basic dog training. By teaching your dog there is nothing to fear when you leave (and more importantly…that you are coming back) you will have a much calmer, less destructive pooch. Some dogs will suddenly start exhibiting this destructive behaviour for a number of reasons including: move in home, change of guardians, loss of a companion pet or human, sudden changes in the home like a child moving out or a change in working hours.